Judge Robby Hassell and GLOS participants rehearse for their upcoming performance of "Trial By Jury." Young artists from across the country recently arrived on UNCG’s campus for the fifth annual Greensboro Light Opera and Song (GLOS), a five-week intensive performance and training program for vocalists. From individual voice coaching to entrepreneurship classes to performances across the state, GLOS is focused on giving students and recent graduates a unique summer experience centered on career advancement. Nationwide auditions were held in the spring and 24 artists were selected to participate. The season kicked off last weekend in downtown Greensboro with “American Art Song as Cabaret,” a celebration of American song. 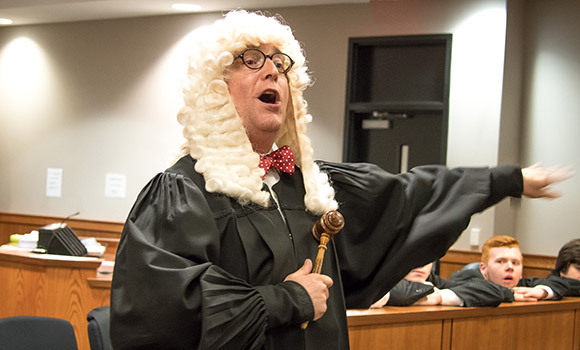 On June 9 and 10, GLOS returns to the stage, performing the Gilbert and Sullivan classic “Trial By Jury” in Courtroom 1C of the Guilford County Courthouse – not your typical opera house. The production, in partnership with the Greensboro Bar Association, features North Carolina Special Superior Court Judge Robby Hassell as the Learned Judge. The following weekend, June 16-19, the group will put on four performances of Gilbert and Sullivan’s “Ruddigore,” also known as “The Witch’s Curse.” All performances are in UNCG Auditorium and will be fully staged with a professional orchestra. The program culminates with performances of Lynn Ahrens and Stephen Flaherty’s “Seussical, Jr.” at Roanoke Island Festival Park in Manteo, North Carolina, from June 22 to June 24. Tickets for all GLOS performances may be purchased online at opera.uncg.edu, by phone at 336-272-0160 or in person at the Triad Stage Box Office, located at 232 S. Elm Street in downtown Greensboro. Tickets will also be sold at the door an hour before the performances. Discount rates are available for students and seniors when tickets are purchased in person or by phone. GLOS is underwritten by a generous grant from the Greensboro Opera. For more information about the program, visit opera.uncg.edu.